I'm not going to speculate whether we'll see more of Curlin (pedigree) on the track this year or next -- it would be fantastic for horse racing as a sport, but probably more than we can expect. Stonestreet Stables' Jess Jackson has already proven to be a true sportsman by bringing Curlin back as a 4-year-old and putting him in premier races to satisfy his fans -- at some point, he's gotta wind up in a breeding shed. And when he does, he'll be perhaps the top stallion prospect in America. There'll be more season applications than spots to schedule. So, what kind of mares will work with Curlin? If he's like his sire, Smart Strike (SRO), Curlin will like daughters of Storm Bird -- so far, that match-up has yielded 100% runners and 82% winners from 11 foals, and a 1.83 AEI. But no stakes winners to date. Comparison with another stallions is apt. Tenpins (SRO) is a son Smart Strike out of a Deputy Minister mare -- the same pattern that gave us Curlin. Tenpins just now has his first juveniles running, so there's not a whole lot to compare, but his best foals are out of daughters of Northern Baby and Foxhound -- both from the Northern Dancer line. And two out of four of his top earners are out of Danzig-line mares. Not much data to go on -- but certainly worth watching as the cross develops. To further this thought, TrueNicks rates the Smart Strike/Danzig cross a solid A, and notes that multimillionaire and Canadian grade I winner Soaring Free (pedigree) is one of the best horses on this cross. I don't have any Northern Dancer-line mares to send his way -- and I suspect his fee will be just ever-so-slightly beyond my range in any case -- but my guess is that this sire line is one of the best bets for Curlin at stud. 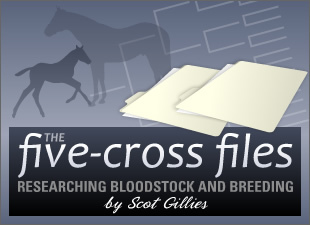 To take it a step further, I'd look specifically at daughters of Northern Dancer's son Dixieland Band (SRO) because it would introduce linebreeding to the blood of Heliopolis, an important strain that has faded to a near memory in Thoroughbred bloodlines. And in a few years, maybe mares by Street Sense (SRO). The son of Street Cry (IRE) (SRO) is not from Northern Dancer's male line, but his damsire is Dixieland Band, and he's inbred to Northern Dancer's dam, Natalma. And wouldn't that be poetic -- a nice match-up between the bloodlines of 2007's big horse racing rivals!